The NewsLine: Lincoln Wins. Now What? The other day, the start of the most exciting day in the history of Springfield, Ill., could not wait for the sun. At 3 a.m., somebody got Election Day started with volleys of cannon fire, and after that there were incessant and spontaneous eruptions of cheering and singing all day long. A moment of delirium erupted in mid-afternoon, when the city’s favorite citizen emerged from his law office and went to vote, taking care to slice his name off the top of the ballot so as to prevent accusations that he had voted for himself. Abraham Lincoln’s campaign button.After the sun went down, he joined other Republican stalwarts in the Capitol building, where they eagerly received the early returns that were trotted over from the telegraph office. The throngs in the streets cheered every report, every step towards the electoral college number, but news from the big Eastern states was coming painfully slowly, and finally the candidate and his closest associates decamped the capitol and invaded the narrow offices of the Illinois and Mississippi Telegraph Company. The advisers paced the floorboards, jumping at every eruption of the rapid clacking of Morse’s machine, while the nominee parked on the couch, seemingly at ease with either outcome awaiting him. Not until 2 a.m. did official results from New York arrive, and the expected close contest in the make-or-break state never appeared: the one-time rail-splitter won by 50,000 votes. 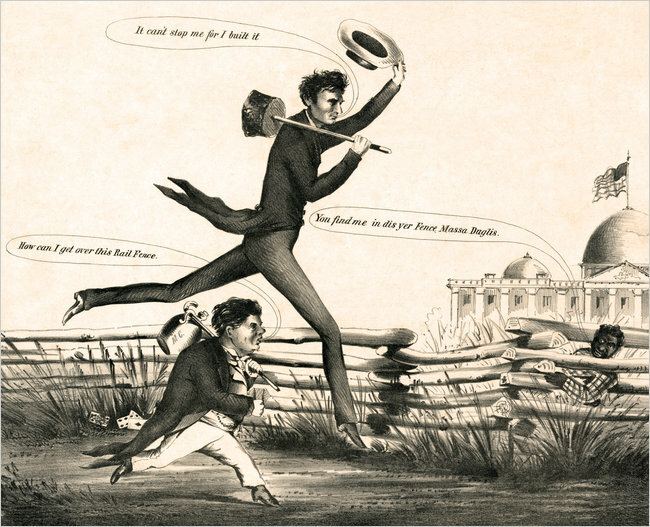 His men cheered, and broke out into an impromptu rendition of “Ain’t You Glad You Joined the Republicans?” Outside, pandemonium had been unleashed, but Abraham Lincoln partook of none it, and instead put on his hat and walked home to bed. Well should he sing, for the days of song will end soon enough. Mr. Lincoln is indeed the president-elect, but barely by a whisker, and what exactly one means by “the United States” any more is apt to become a topic of some heated discussion. 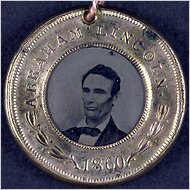 Lincoln won his parlay, taking 16 of the 17 Northern states that he set his sights upon, including the hard-fought New York, and most by a solid majority. But there were states where he was more lucky than popular, like California, where all four candidates polled significant numbers. Lincoln won only 32.3 percent of the ballots, but managed to eke out a victory and capture the state’s four electoral votes by the wafer-thin margin of 734 votes. A similar, if slightly less dramatic story played out in Oregon, where Lincoln’s victory margin was fewer than 1,200 votes. In his home state of Illinois, facing Mr. Douglas, Mr. Lincoln won by fewer than 12,000 out of 350,000 votes cast, a clear win but hardly a romp. The Lincoln and Hamlin election ticket from 1860.The South, of course, presents a vastly different picture. In the states of Alabama, Arkansas, Florida, Georgia, Louisiana. Mississippi, North Carolina, Tennessee and Texas Mr. Lincoln received a combined total of no votes. None. True, his name wasn’t even listed on the ballot, but that seems to be a mere technical oversight that would have had no great consequence. After all, in Virginia, the largest and wealthiest southern state, Mr. Lincoln was on the ballot, and there he tallied a total of 1,887 votes, or just 1.1 percent of the total cast. The results were even worse in Kentucky, his place of birth. One might have thought that sheer native pride should have earned him more than 1,364 of the 146,216 votes cast, but perhaps Kentuckians resented that he deserted them at such a tender age. All told, Mr. Lincoln will assume the presidency in March on the strength of his muscular 180 electoral votes, and despite the puny 39.8 percent of the popular vote he accumulated. The narrowness of this fragile mandate (if that word can even be used) naturally invites speculation about what might have been. The year began with Mr. Douglas standing, like Franklin Pierce and James Buchanan before him, as an electable anti-slavery Northerner who could be depended on to maintain southern prerogatives. But from the moment last April when fire-eating Southern Democrats made it clear that they would rather punish Mr. Douglas for his vote on the Kansas-Nebraska Act two years ago than win the White House in the fall, it was ordained that the Little Giant, so long touted as a certain president-to-be, was steering a doomed vessel. Yet there were times when his campaign picked up speed, and at such moments Mr. Douglas seemed very close to capturing enough support to thwart Mr. Lincoln’s northern sweep and deny him his electoral college majority. Had that happened, Mr. Douglas would be sitting solidly in second place. He would have demonstrated support both north and south, and he would offer the South preservation of the status quo. That might well have been enough to pacify the reckless Southern Democrats who shunned him in the spring, and to win their support in the House of Representatives. But for every Douglas surge there was a Douglas blunder. Final tallies show that wherever Mr. Douglas actually campaigned in New York, he won more votes than President Buchanan took when he captured the state four years ago. But instead of investing his time in the Empire State, Mr. Douglas headed into the inhospitable South, where he did the seemingly impossible — he managed to make southern voters dislike him even more than they already did. Appearing before a crowd in Virginia, he was asked if the election of Mr. Lincoln would justify secession. A politician of Mr. Douglas’s experience should have known how to handle this kind of question with finesse, but instead he offered the one answer certain to damage him. No, he told the crowd. He might have stopped at that, but perhaps figuring that, having jumped the fence, he may as well have a picnic, he told the crowd, It is the duty of the president of the United States to enforce the laws of the United States, and if Mr. Lincoln is the winner, I will do all in my power to help the government do so. With that answer, Mr. Douglas dismissed the purported right to secede that the south so cherishes, and surrendered his claim as the only man who could be counted on to keep the union together. Now that task falls to a president who received fewer than four votes in 10; a president who is purely the creature of only one section of the country; a president who, apart from one undistinguished term in the House of Representatives a decade ago (and a period in the state legislature), has no experience in public office; a president who comes from a Republican party that has been stitched together from various interests, who will be asked to work with a Congress whose two houses are controlled by Democrats. Mr. Lincoln has made his position clear: while he is against slavery and calls it evil, he would not do anything — more to the point, that he is powerless under the Constitution to do anything — to end slavery where the Constitution already permits it. The line that he has drawn is against an expansion of slavery in the territories, but look at a map: there are no more territories held by the United States in North America that are in dispute. On every other matter relating to slavery he has been silent. And ultimately, they ought to realize that Mr. Lincoln may not be an experienced politician, or have strong political support, but that by training and avocation, he is a lawyer, and a good one. And almost every lawyer will tell you that it is cheaper to settle a matter quietly than to fight it out in court.